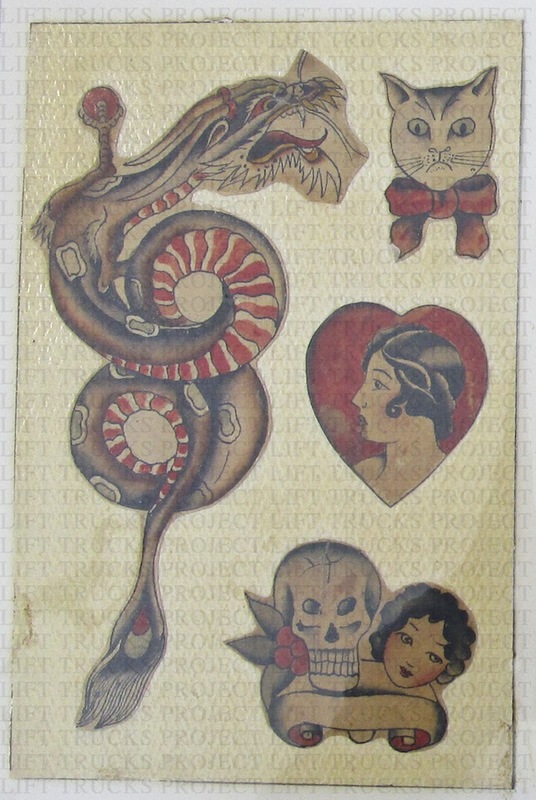 Mr.Thomas Berg was an English tattooist who came to the United States at the turn of the century. He is known to have tattooed in San Francisco where he worked doing hand and electric tattooing. 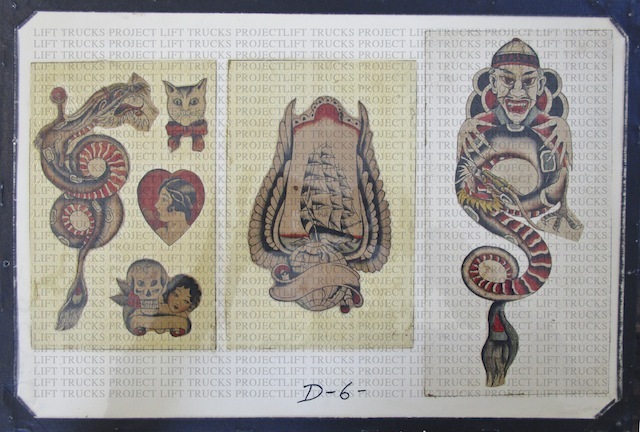 As with many tattooists of that era, Berg offered designs, stencils and color for sale. His shop along with Capt. Jack Howard was in one of the roughest and toughest sections of old San Francisco – the so-called Barbary Coast area was lined with whorehouses, opium dens, shanghai bars, flop houses as well as the more up-scale “parlor houses.” His flash designs were quite detailed for that era and he probably worked with a single needle set-up, which was not unusual in England at the turn of the century. The fantasy drawing of a dragon is particularly compelling. A Japanese influence fish tail imparts the look of an angry eye. Even more peculiar is ol’ sour puss in the corner, all too reminiscent of the internet-famous Grumpy Cat (8.6 million fans on Facebook.) Even the scroll under the skull and girl looks like the back bumper of a 1960s land-yacht. Thomas Berg, we hardly knew you, but your timeless artwork aged beautifully. This entry was posted in Uncategorized and tagged Antique Tattoo, Grumpy Cat, Tattoo Flash, Thomas Barg. Bookmark the permalink.